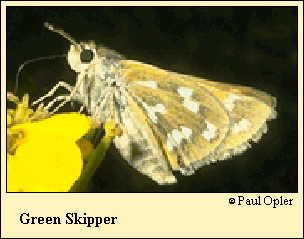 Identification: Upperside is bright golden-orange; male has a few pale spots on the forewing, female has more. Male stigma on forewing has black felt. Hindwing is bright green-orange to yellow-orange with distinct white spots. Spot band curves away from the margin. Life history: To wait for receptive females, males perch in gulches during the day. Females lay eggs singly on or near the host plants. Caterpillars feed on leaves and live in nests of tied-together leaves. Caterpillar hosts: Various grasses including blue grama (Bouteloua gracilis), fluff grass (Erioneuron pulchellum), and buffalograss (Buchloe dactyloides). Habitat: Mesquite grassland, chaparral, prairie, canyons, ravines, roadsides, dunes. Range: Eastern Wyoming and western Nebraska south through the foothills and high plains of Colorado, western Kansas, eastern Arizona, New Mexico, western Oklahoma, and west Texas to Mexico.